Seattle hasn't made the playoffs since its 116-win team demolished the AL West in 2001, but expect Felix Hernandez and the Mariners to end that postseason drought with a division title this year. This week, SI.com is previewing all 30 MLB teams, counting down to the No. 1 team in the league. At No. 3: the Seattle Mariners. The Mariners have not been to the postseason since 2001, the second-longest drought in the majors behind only Toronto’s, which dates to 1993. But that streak should end this year. Last season, Seattle quietly posted the best ERA in the American League (3.17) and allowed the fewest hits in baseball. The rotation is fronted, as always, by Felix Hernandez, who led the league in ERA (2.14) and WHIP (0.915) and finished second in the AL Cy Young voting. King Felix has been the AL’s best and most consistent starter over the past six seasons, but Seattle has surrounded him with its deepest staff in years. Hisashi Iwakuma has averaged a 15–8 season and 3.07 ERA since coming over from Japan in 2012, and another year like that would make him one of the best No. 2 starters in the majors. Fortunately for the Mariners, they have other candidates for that spot, namely two of their heavily-hyped young starters: 26-year-old lefty James Paxton and 22-year-old righty Taijuan Walker. That duo combined to go 8–7 with a 2.89 ERA, and Walker in particular has looked sensational this spring, not allowing a run in 18 innings through March 26. Offensively, Robinson Cano had a strong debut campaign in Seattle last season, hitting .314/.382/.452, and he got some help from breakout All-Star Kyle Seager, who finished with 25 home runs and 96 RBIs, contributing Gold Glove defense at third base. Both of them, however, are lefties, so general manager Jack Zduriencik went out and added a slugging righthanded bat in Nelson Cruz in free agency. Cruz bopped a major league-best 40 home runs for the Orioles last year, which should come in handy on a team that finished 11th in the AL in slugging percentage and 10th in home runs a year ago. The Mariners don't have a strong track record when it comes to signing righthanded power hitters in recent years. Adrian Beltre, Jason Bay and Michael Morse, as well as switch-hitter Kendrys Morales, all underperformed in Seattle, so it is at least reasonable to wonder what, if any, drop-off Cruz might experience hitting at spacious Safeco Field, especially if his career-best home run output from last season proves to be a contract-year spike. The Mariners will need Cruz to help with their power production, but they’ll settle for help from anyone in getting on base. Seattle’s .300 OBP was the worst in the AL, and it doesn’t figure to improve much with Austin Jackson atop the lineup. Jackson has a career .336 OBP, but he posted a dreadful .267 mark after coming over to Seattle from Detroit in a midseason trade. The Mariners will need newcomer Seth Smith, who had a .367 OBP for San Diego, to pick up the slack in that department hitting behind Jackson to set the table for Cano and Cruz in the heart of the order. 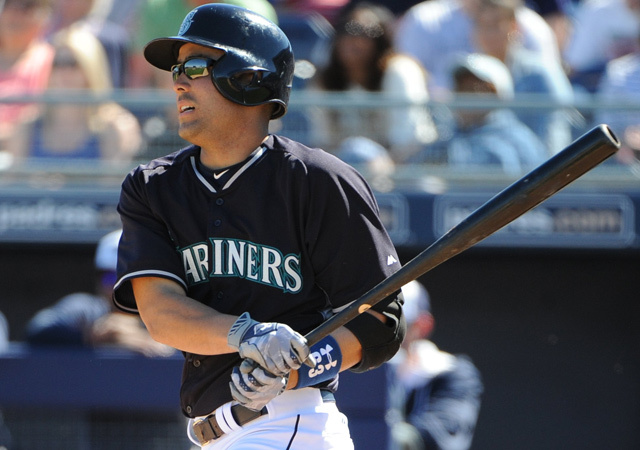 It speaks to just how much promise Montero showed in his 18-game cameo with the Yankees in 2011 that he could even be considered for this spot after four years of mediocre or worse production, but such is the desperate state of both his career and Seattle’s offense. Montero, the game’s No. 6 prospect as recently as 2012—his first year with the Mariners after being traded for Michael Pineda—has played only 35 games in the majors the past two seasons combined, hitting four home runs. He was hopelessly overweight in '14 and spent most of the season at Triple A, though he did hit 16 homers and produce an .839 OPS. Montero arrived at spring training this year in fantastic shape, and despite getting assigned back to the minors, he could find himself fitting into the Mariners' plans at first base, where 27-year-old Logan Morrison is coming off a .735 OPS season that hardly makes his job secure. That is the Mariners’ league-best Park-Adjusted Defensive Efficiency numbers from 2014, according to Baseball Prospectus, a stat that measures how well teams turn batted balls into outs and adjusts for ballpark factors. Those favoring more traditional defensive metrics might note that Seattle committed an AL-low 82 errors last season. Though Seager was the only Gold Glove winner, the defense was an underrated aspect of the Mariners’ 16-win improvement a year ago. That defense could be even better in 2015 with a full season from Jackson in center and Miller at short. "I never have evaluated him as a leadoff-type guy. He’s not a great fastball hitter, he doesn’t hit for power, he doesn’t hit for average and he’s not a high-pitch–at-bat guy." "He probably has the most rhythmic leg kicks in the game right now. Never off beat, always on time, doesn’t swing at a lot of bad pitches. When I first laid eyes on him in the minor leagues, I’m like, 'Who’s this little weeble-bodied guy?' But man, he’s just strong and can straight up hit. Lefty, righty, it doesn’t matter​."